Llanelli-based Jenkins Bakery has installed CyBake Touch shop management software to manage production, recipes, stock control and purchase ordering in all of its 27 shops. Jenkins Bakery is an independent, family-owned firm founded in 1921. The company said it prides itself on the quality of its products, the frequency it refreshes its range and a strong local reputation. It has an impressive weekly order book for celebration cakes. The business employs nearly 300 people, full and part-time, at its headquarters in Trostre, Llanelli, and across a network of shops that stretches from Carmarthen to Bridgend to Ystradgynlais in the north of the area. Jenkins Bakery has been using York-based RedBlack Software’s CyBake bakery management system at its head office since 1999. CyBake Touch shop management software is RedBlack Software’s fastest-growing product and is sold separately from its flagship CyBake offering. Jenkins Bakery runs CyBake Touch on EPOS till systems from Tiverton, Devon-based C2Epos. 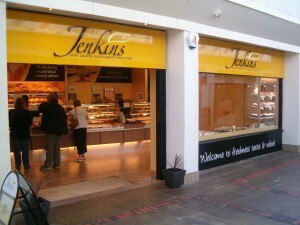 CyBake Touch is now used for ordering between head office and Jenkins Bakery’s shops. Shop managers place orders, input waste and stock data and check-in deliveries via their EPoS touch-screens. Head office gets orders, sales, returns and shrinkage data direct from the tills via the web. The bakery installed CyBake Touch to help it increase sales by getting the right products into the right shops at the right times. The aim is also to reduce waste and keep all shops within the company’s wastage targets. Better sales have been achieved and the company plans to hit its waste targets by placing more products under the control of CyBake Touch’s automated sales-based ordering system. CyBake Touch’s automated sales-based ordering system suggests its own shop orders to improve on those by shop managers. The sales-based ordering function takes historical sales data from tills to calculate orders in a way that is not practical manually and corrects staff assumptions about consumer trade-offs. The company reports the installation of CyBake Touch has enabled it to handle a reduction in administrative staff at the same time as opening new shops. CyBake, and now CyBake Touch, are closely integrated with the firm’s Sage Line 50 accounting software. Jenkins Bakery’s financial controller Martin Newbury said this integration keeps control of what amounts to internal purchases for the shops from the company’s various production departments. Similarly, the integration between CyBake in head office, CyBake Touch in the shops and the company’s Sage accounts package improve controls over costs. Newbury describes this integration between accounts, production and now shop management software as akin to an ERP enterprise resource planning system where all elements are controllable from one point. “We are a growing business. We have opened two new shops in the last ten months. A third new shop is in the pipeline. As we’re getting a bit bigger, control is key. If you start losing control and people start ordering products that they shouldn’t be ordering, all of a sudden you’re losing your margin, so it is vital to maintain that control,” he said.